The last entry about Niagara Falls featured the USA side. As promised, here is an entry about the Canadian side. 1. Be ready for the cold. 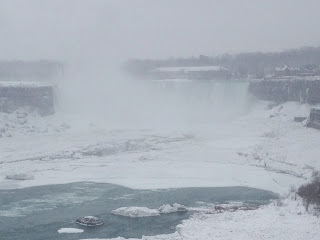 As one might expect, January in Niagara Falls (either side) is (very) cold and there seems to be precipitation every day. But the view was breathtaking and worth the trip. I saw cars with Canadian license plates stopping to get out and take pictures like tourists. Apparently, I wasn't the only one impressed. Horseshoe Falls, Niagara Falls, Ontario, Canada. 2. Be ready to cross the border. As I stated in the previous entry, start from New York, if you are coming from the USA and take the Rainbow Bridge. There will be a cash toll and you will show official ID. Everyone will need a passport (or passport card) or enhanced driver's license. Once across the border, just follow the signs towards the Falls. If you walked, that's pretty easy. However, if you drove, there will be plenty of parking garages. 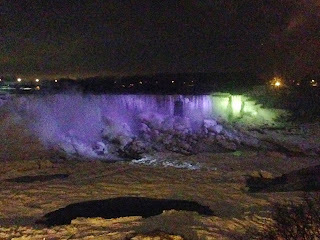 Toward the end of the Horseshoe Falls, there is a parking lot and you can stroll along the sidewalk of the Falls. At the opposite end, near Clifton Hill, there are parking lots and garages near the casinos and other attractions. 3. Be prepared for limited attractions. In winter, the boat tours of the falls are closed. 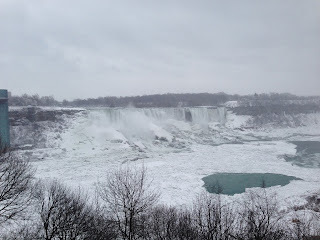 In fact, there are signs everywhere near the Falls themselves that even the sidewalks are not maintained during winter and you are on your own. The spray carried by the wind and consistent rain and snow make walking treacherous, so dress accordingly. 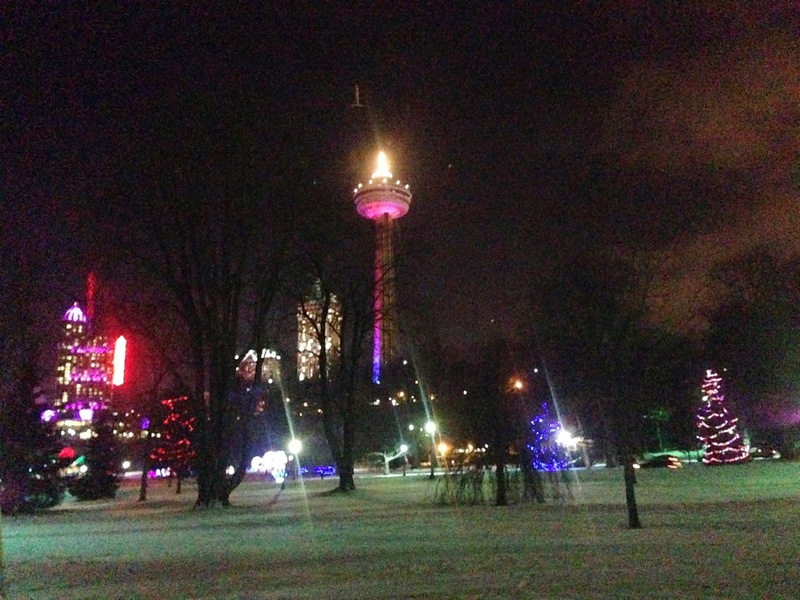 Near Queen Victoria Park is the Skylon Tower, an observation tower to see the Falls from on high. 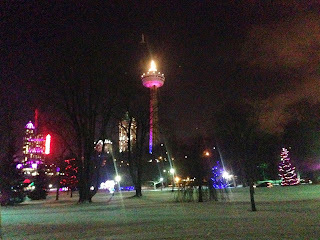 Along with the ferris wheel on Clifton Hill, and a few other buildings, this makes of the skyline of Niagara Falls, Ontario. The main drag is Clifton Hill, which resembles a wannabe Las Vegas/Times Square at night. 4. 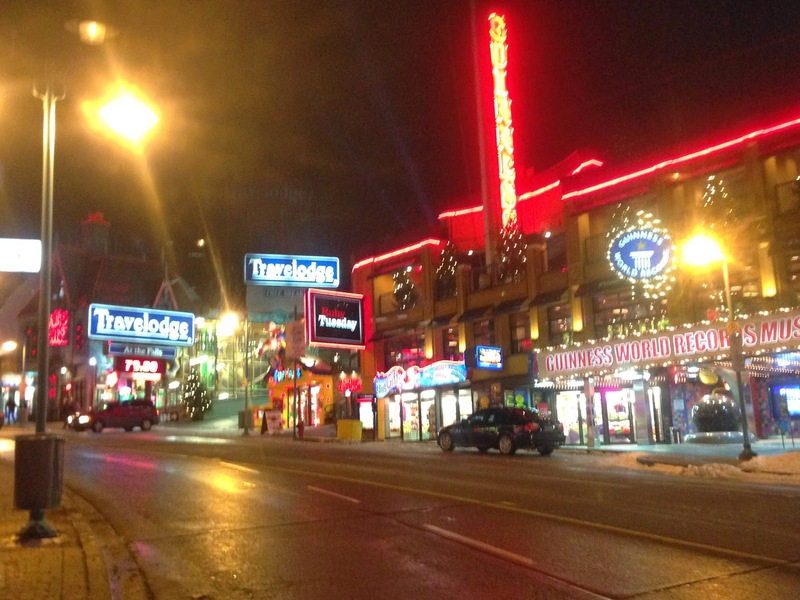 Why people think this is the nice side: Clifton Hill is full of inexpensive family places to eat, lodgings that escalate in price during warmer weather and every wax museum known to man. There are arcades, souvenir shops, the Guinness Book of World Records and all sorts of interesting variations on theme parks such as MGM Studios Plaza and an upside down house museum (seriously). After seeing the Falls and the Whirlpool, you may need something else to do. All of these attractions take money and if you plan to stay a week (which I would not recommend), you need activities and a good amount of cash. The so-called "nice" area is very small and it is clear that all tourist attractions there exist simply because of the Falls. For those who brave the winter elements to see the Falls, you can enjoy the indoor water park at Great Wolf Lodge, straight up Victoria Avenue (Clifton intersects with Victoria, not within walking distance). Other than that, look for hotels with indoor pools. Don't forget the fireworks schedule and even if it is winter, go see the Falls lit up at night. 5. What do you do in nicer weather? In tourist season, the Maid of the Mist, the boat that takes you through the gorge and right up to Horseshoe is worth the money. You can take it from the USA or Canada side. 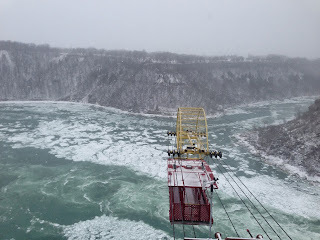 Other Falls attractions can be found on the Niagara Parks website, such as Journey Behind the Falls (open in winter), Niagara's Fury (closed for part of January) and, something new to compete with the Maid of the Mist, Hornblower Niagara Cruises, where you sail aboard a catamaran. Another interesting nature-based attraction is the Whirlpool Aero Car, also part of the Niagara Parks attractions. Located along River Road/Niagara Parkway, not too far off Victoria Avenue, it's about a 10 minute drive from the Falls. The Aero Car will take you over the Whirlpool during tourist season. If you are driving, parking is free and tickets are available there or part of a package sold by Niagara Parks. 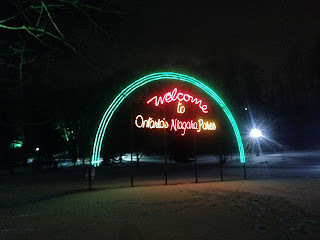 For more information: Fun at the Falls, Clifton Hill, Top of Clifton Hill, Niagara Parks and Skylon Tower. 1. Books still rock! My favorite publishers are Rick Steves, Fodors, Frommers, Moon and Lonely Planet. They write in a clear, honest, common sense and entertaining manner. I carry one travel sized version and buy the others electronically. They're excellent for doing your research and planning your trip. 2. Pamphlets. Once you get where you're going, grab a couple of pamphlets. Keep your options open so that you can be spontaneous. 3. Maps. Street by street maps are invaluable. They can be bought in bookstores or ordered online. Get print maps because some online maps require the internet (although there are off-line versions). Study it before you walk around foreign countries, it's safer. My favorites: Borsch, Rick Steves, Streetwise, StreetSmart , the VanDam Pop Ups, MapEasy's Guidemaps, and Insight. When I arrive I pick up a public transit map. Many maps also have many sightseeing tips, which take the place of carrying travel books. 4. Friends and Family. People who live or who have traveled to a destination are excellent resources. Locals often know off the beaten path. Also, talk to the concierges and hotel reps. Of course, they will promote certain businesses, but they have good ideas. 5. TV Shows. Not only travel shows, but food shows and those "Top 10..." shows, such as the 10 best roller coasters, best beaches, etc. They give you ideas of places to go or what to do when you get to your destination. This is one of a series of reviews of mid- to smaller- class ships offered by cruise lines, who tend to advertise the largest ships with the most amenities. But smaller ships may fit your budget, timeline or have the itinerary you want. Don't limit yourself to the only the biggest class of ships, you may be pleasantly surprised. Check out our review of the Royal Caribbean Jewel of the Seas. 1. The decor is reminiscent of the Renaissance. The lounges were spacious and there were plenty of areas to relax. 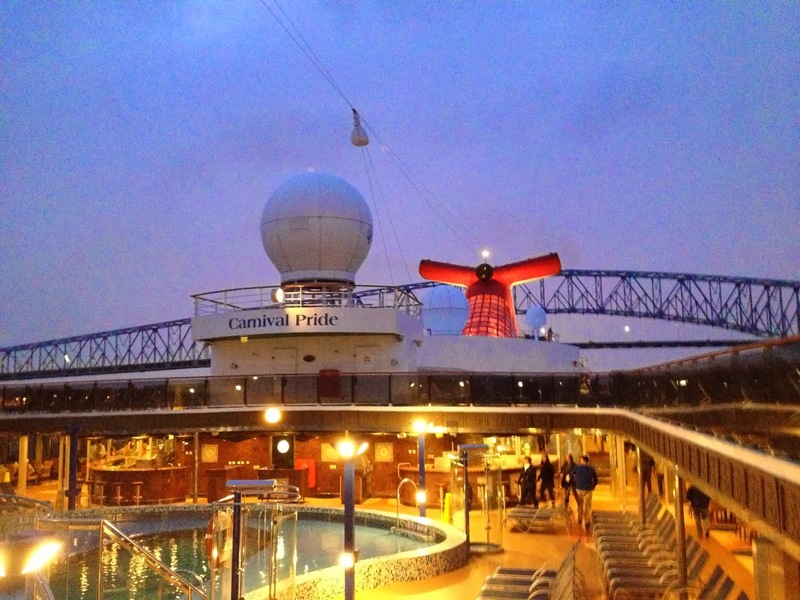 Most of the customer areas are on the Atlantic deck, making life very convenient. 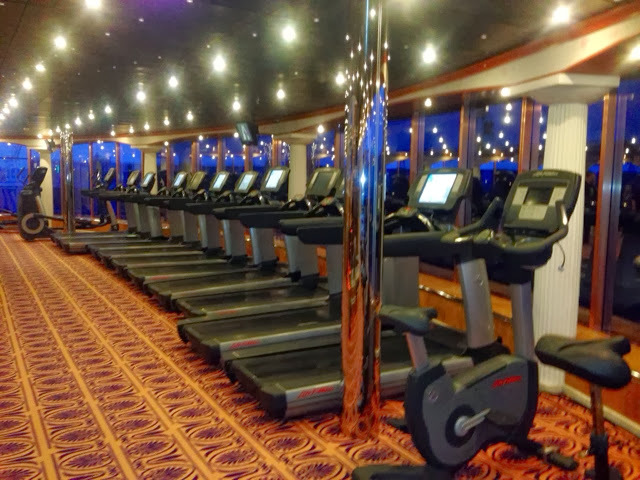 Like many of Carnival ships, some of the mid- and lower-class of ships have been upgraded to contain many of the amenities that were introduced on larger ships: the burger grill, the sushi restaurant, the bar and grills and other amenities. 2. 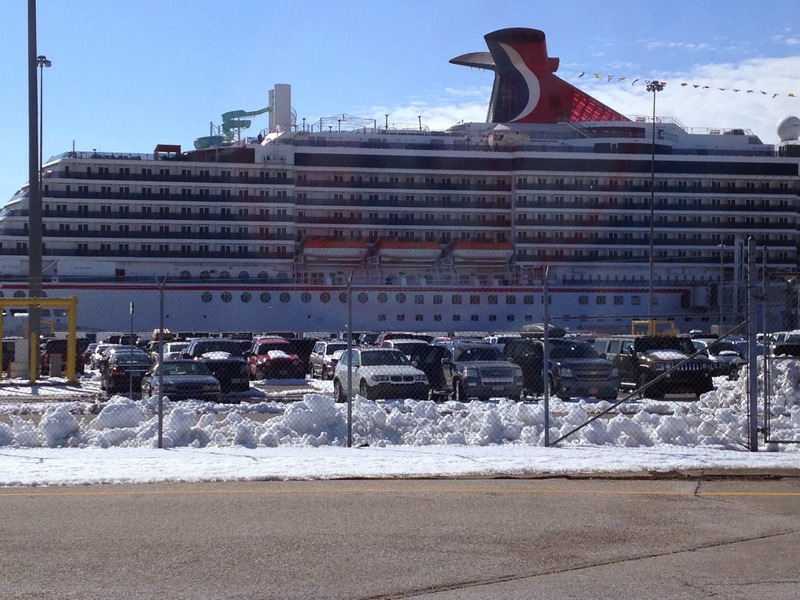 This ship is good for a winter sailing: the Lido deck has a pool area with a retractable roof. This ship frequently sails from Baltimore, Maryland, an easy drive for people from the I-95 corridor. It books quickly in the winter months. 3. Like many Carnival cruises, the sea day brunch and teatime are offered on sea days on longer sailings. A cruise from North to South USA may have 2 sea days down and 1-2 days back up. 4. The fitness area was spacious and offered many services: cardio, spa, classes, free weights and machines, hot tub, sauna, steam room, beauty parlor, the works. For experienced cruisers, this may be worth the extra cash to pamper yourself on sea days. 5. There was plenty of activities for those over 21 and for those who came to shop: casino games, guess the price of the painting, "sales" in the shops, trivia and live music. Don't forget the adults only area on the Lido deck. 6. For the under 18 crowd: Carnival offers the clubs that are closed to parents after the orientation. Check with the latest info: you may have to pay for the young ones in the evenings. The pools are available as is the arcade, and the Dr. Seuss events (like the breakfast and character greetings).